Technology has come a long way since Computers merit badge was first introduced in 1967. This badge will teach Scouts about technology in the digital age. ALL YOUTH MUST BE ACCOMPANIED BY AN ADULT. All merit badge workshops are three hours in length on the dates indicated. Upon fulfilling the requirements, the Counselor will electronically sign a printable Blue Card and award. During their workshop, Scouts will have a period of free time so they can enjoy a hands-on experience with the newest technology found in the store. 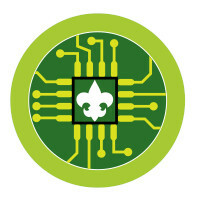 Scouts must complete the Cyber Chip prior to the class in order to complete this merit badge.